Today, as my friend Oren Miller is laid to rest, I can think of no better tribute than to spend time with my kids. So I had lunch with my college age daughter. Spent the afternoon with her and David. Then supper with most of the family. 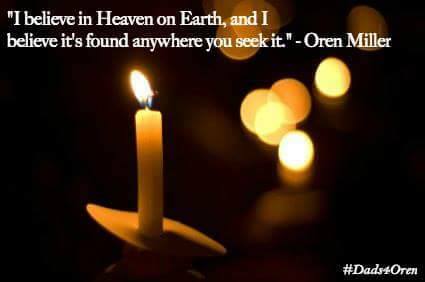 Oren was a humble man. Who loved being a father. Here is a collection of Billy Joel that a few dads put together when Oren and Beth couldn’t make a long planned concert event because of Oren’s cancer treatment. Oren brought a bunch of fathers together in the dad blogger group. Through his example, we learned that it is possible to find Heaven on Earth. Thank you Oren. For being you.